Osaka is commonly seen as a city for travellers to transit at before jetting off to glossier cities like Tokyo and Hokkaido, but it shouldn’t be that way. 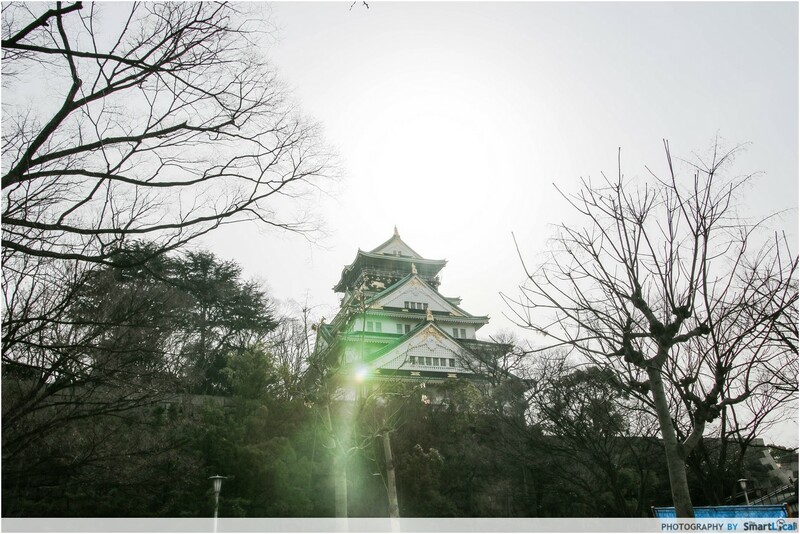 Osaka has steadily grown into a destination to visit over the past few years. 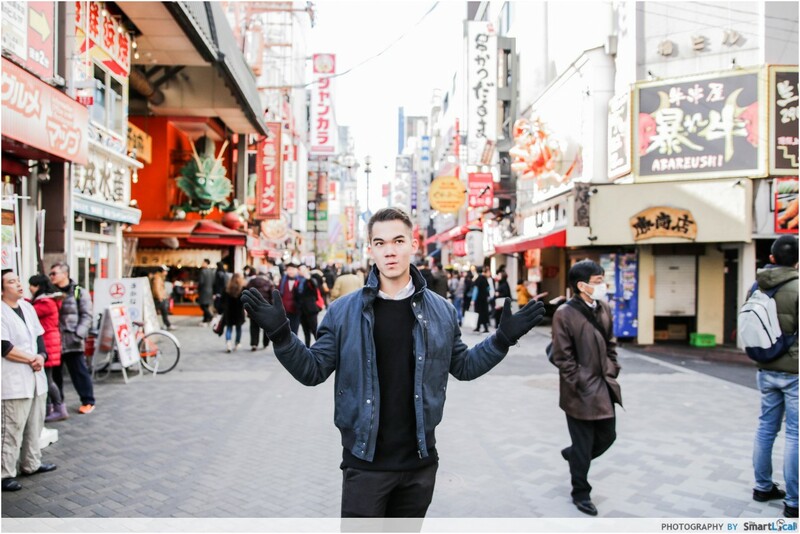 There's so much to see there - it's the second largest city in Japan! It’s hard not to wonder why Osaka is significantly less popular than its other counterparts. 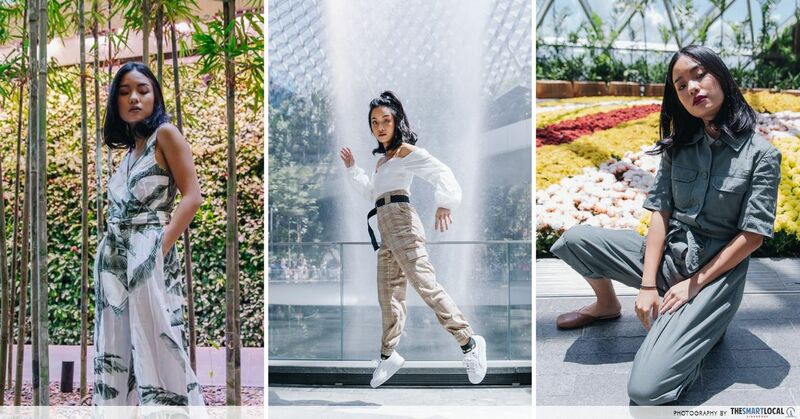 We hopped on a Scoot flight to discover more of this understated travel destination for ourselves, through Singaporean eyes. We spent 72 hours there, which isn’t a lot of time - but if you are already freaking out about the constraints of a short weekend getaway, fear not. This article will help you scoot to and fro Osaka without missing out on what this vibrant city has to offer. 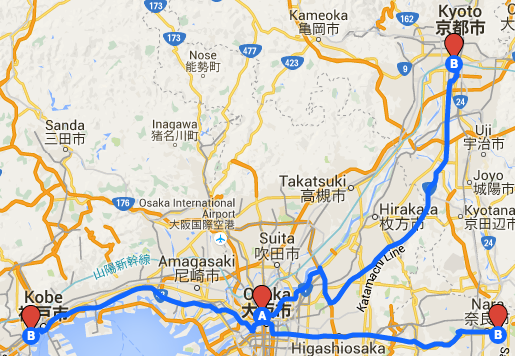 Here’s the Osaka Trinity: Things to do, things to eat and the bonus cherry on top of Day Trips. If the only izakaya you've ever been to is FIVE Bar in Singapore, then you definitely need to have a real taste of Japan's pub culture. The idea of popping into a bar in a foreign destination can be intimidating, we get it. That's why we recommend going on a small specialised Bar Hopping Food Tour like this one by Magical Trip. For a small fee of $65, a friendly local guide will take you and your posse through Namba's happening back-alley Izakayas for an authentic taste of Osaka's nightlife. 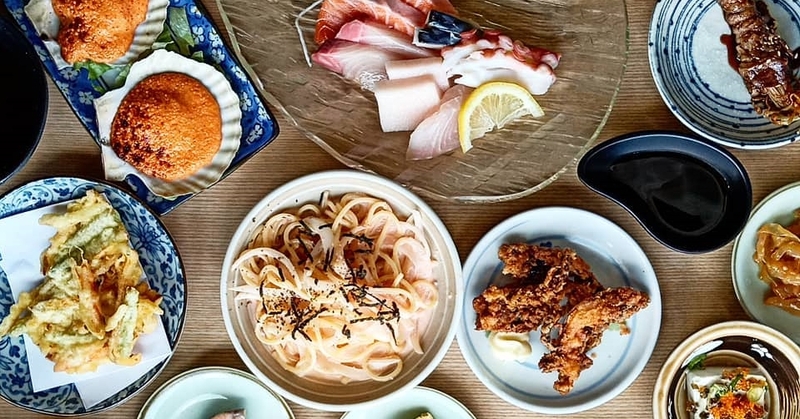 Expect lots of sake, Japanese beer, and bar bites in the form of kushikatsu (deep-fried skewers), yakitori (grilled chicken skewers) and even a small bowl of ochazuke - a local dish of green tea and dashi over rice. 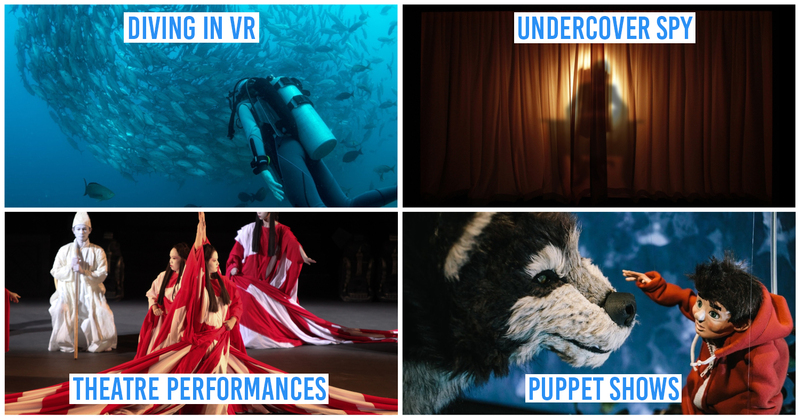 Check out more of Magical Trip’s niche tours here. Note: The tour is only for people over the age of 20. Harry Potter loves one owl. I love all the owls. 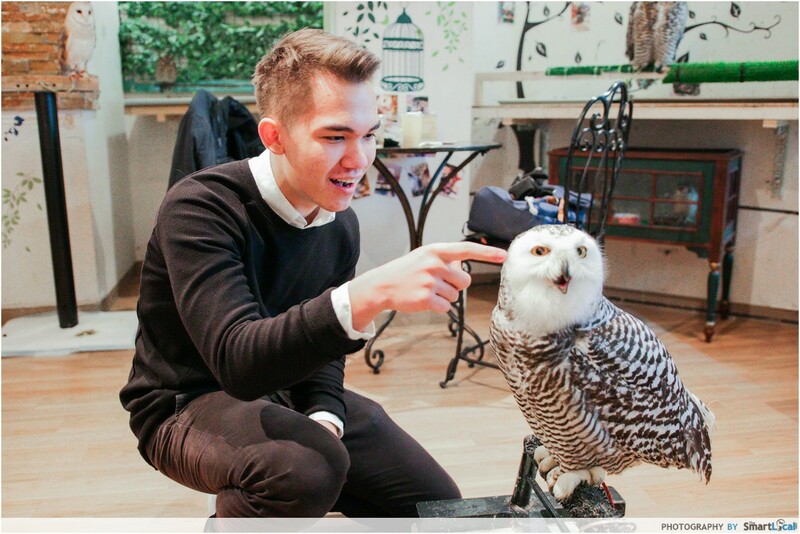 When I entered the ‘Lucky Owl Cafe’, I felt like a teenage girl meeting Justin Bieber for the first time. A complimentary drink is served after you pay the entry fee of ¥1500 (~SGD18), which is a little pricey. 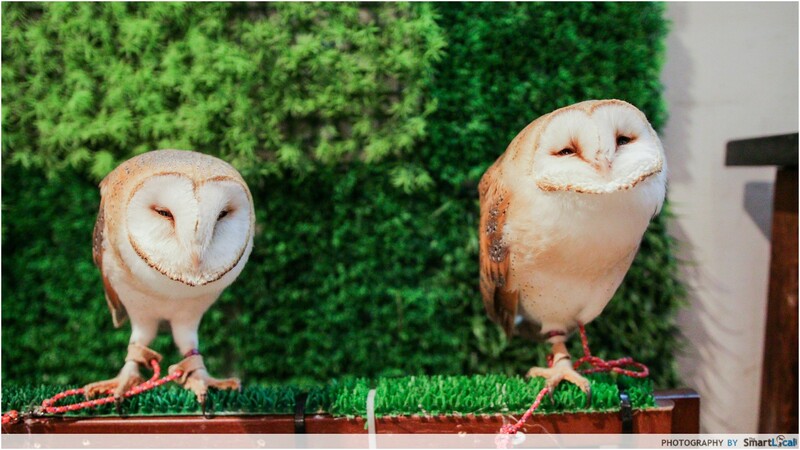 So if you are no owl fanatic, you might want to allocate your finances elsewhere. But then again, how often do you get to fondle the beak of a Wizard’s most trusted companion?! 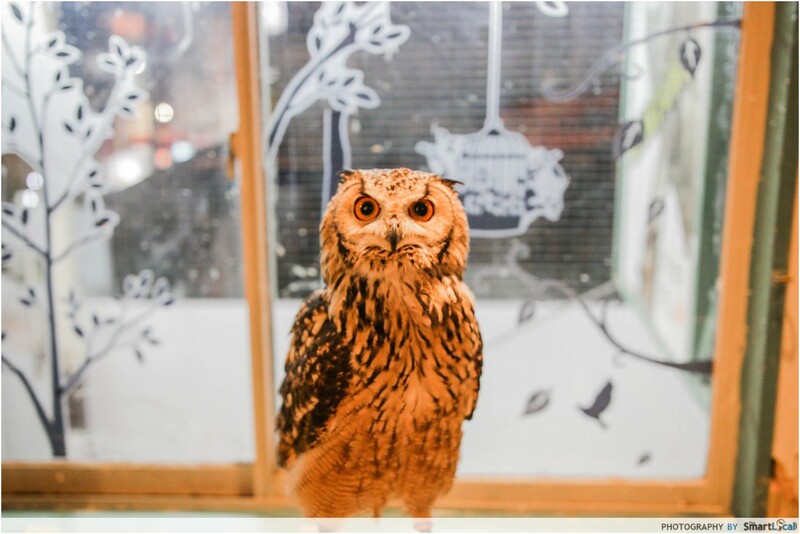 Live owls are perched on branches surrounding the walls of the cafe. There are a few ‘diva’ owls which you can look at but not touch. While the rest are friendlier, keep the stroking to their beaks only. Why? 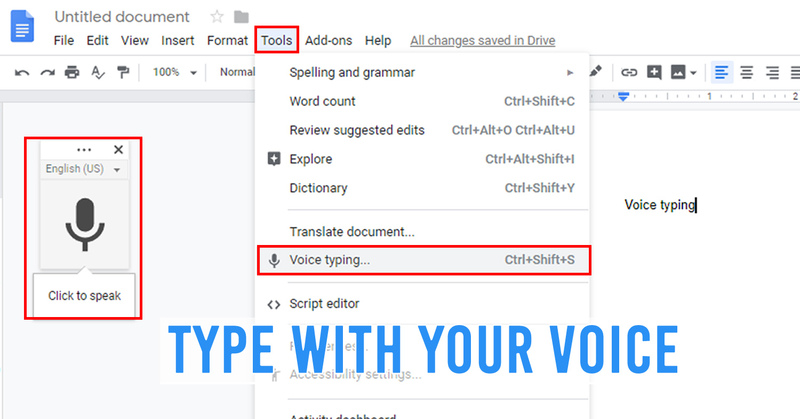 I found out the hard way. They get annoyed and start to bite and peck if you try to stroke their head or feathers. Don’t let your hands get carried away! The arcade culture here is no joke - just watching them play is like a performance in itself! Going to the arcade may be a distant memory from our secondary school days. 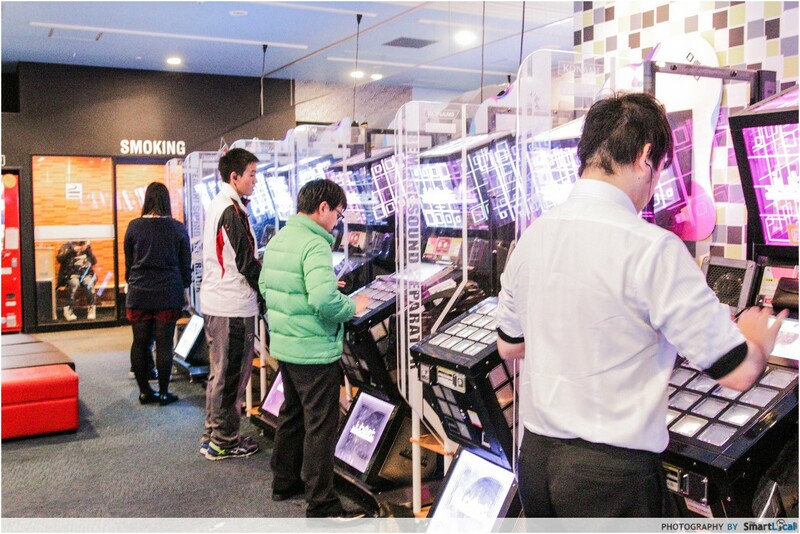 In Japan, going to the arcade holds no limit and age is just a number. 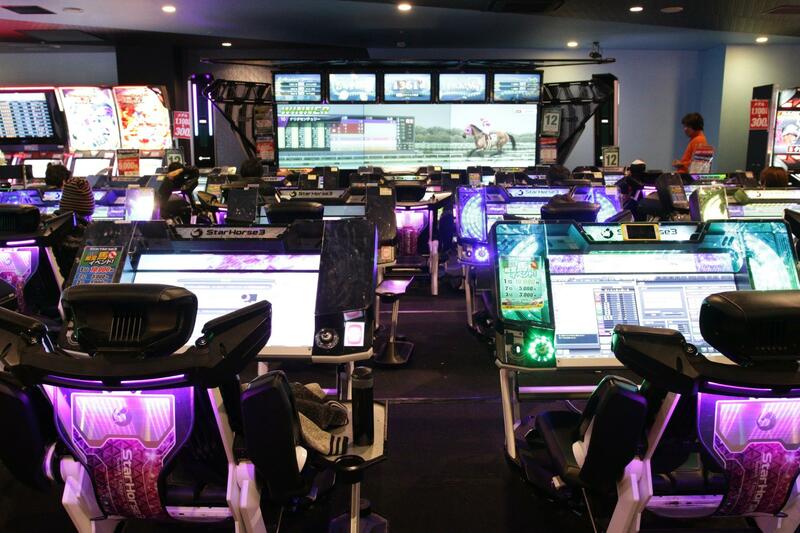 Located at the start of Dotonbori street, Round 1 Stadium is what you can imagine an arcade would look like if it were 7 stories high and created by the Japanese. We entered the Arcade at around 7.30pm, and it was a sight to behold, witnessing so many people clothed in office attire shuffling their feet to dancing booths after work hours. 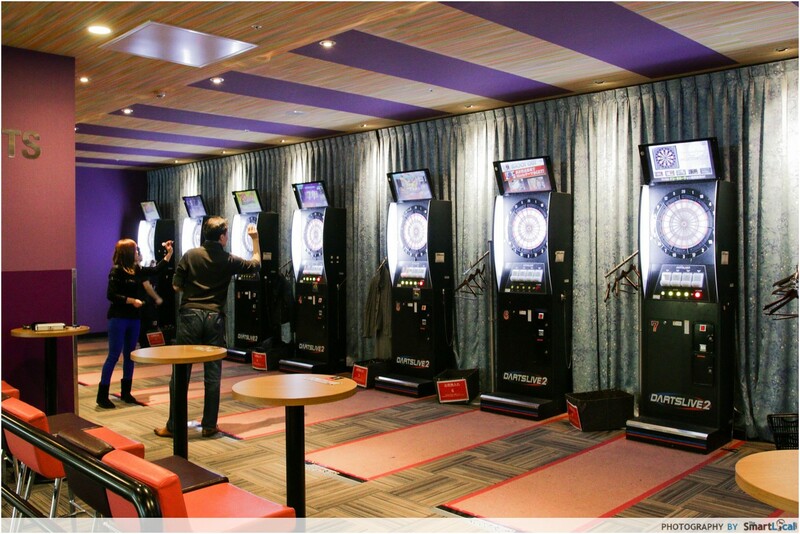 Other than the conventional games, you’ll also find a mini gambling den a level above, including virtual horse betting and slot machines. 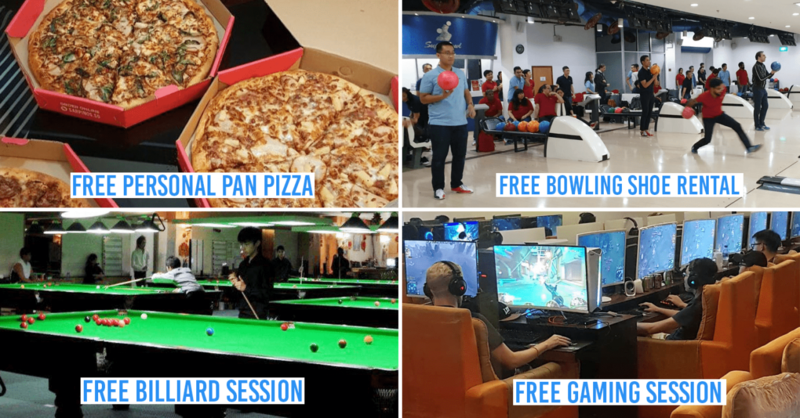 Those looking for something less loud and action-packed would be happy to know that activities such as table tennis, billiards, bowling and karaoke are also available upstairs. The Japanese selfie booths are a highlight of arcade culture. 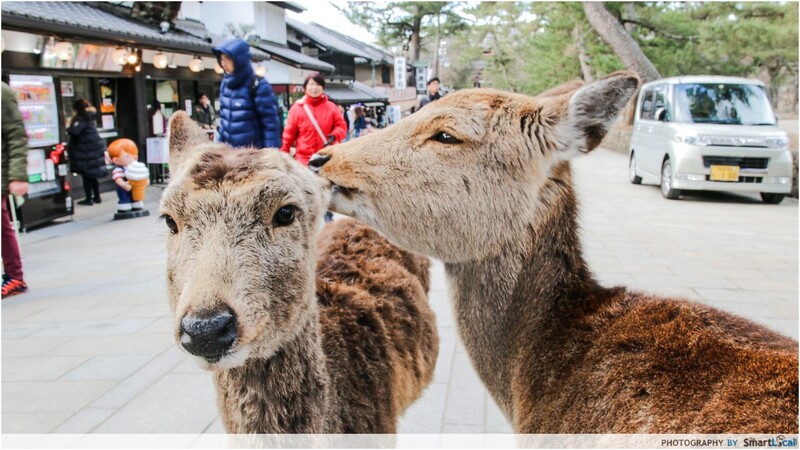 We are used to stepping into a booth, distorting our faces and applying filters, but that is nothing compared to what the Japanese have - an unparalleled commitment to taking the cutest photos. Within the aforementioned arcade, you’ll discover this lane of selfie booths at Basement 1, inclusive of costumes and dressing rooms. You’d see groups of friends in front of mirrors applying makeup, prepping themselves up for the shot. 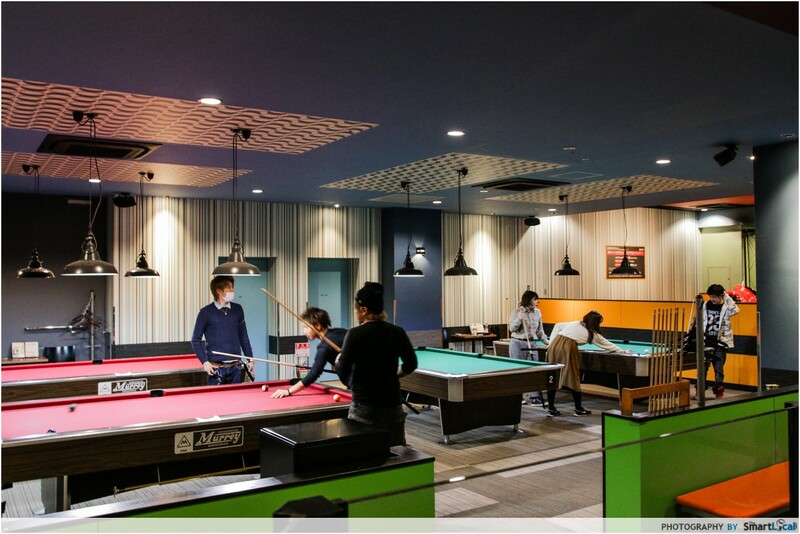 The other floors are dedicated to indoor sports, KTV and other entertainment activities. 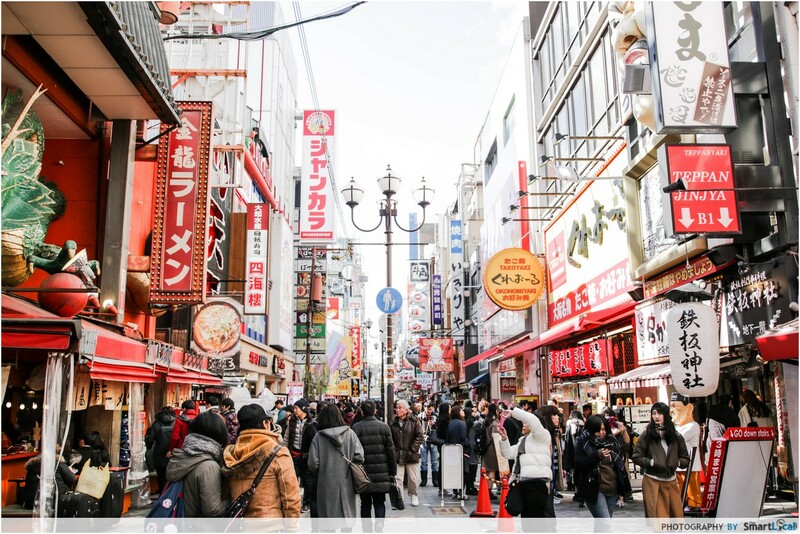 A street down from Dotonbori, we found ourselves at one of the oldest and busiest shopping districts in Osaka - Shin Sai Bashi-Suji, up to 600 metres long! Saturated with branded shops, independent boutiques, and a couple of restaurants, this is a must do in any shopper’s itinerary. Just be prepared to spend at least half a day there, I lost count of the number of shops I went in within the first hour. One experience that shows you’ve undoubtedly made it to Japan is going to their world famous hot springs, better known as onsens. And if you haven’t got the memo, the onsen experience requires you to strip down to absolutely nothing. Initially, I was very uncomfortable with the thought of having to bare myself in front of strangers and strut about like it’s another day on earth. But before you know it, you get used to the environment and start to enjoy the experience. If you’re not accustomed to very hot water, the first dip into the pool is going to feel like your skin is on the verge of peeling off. 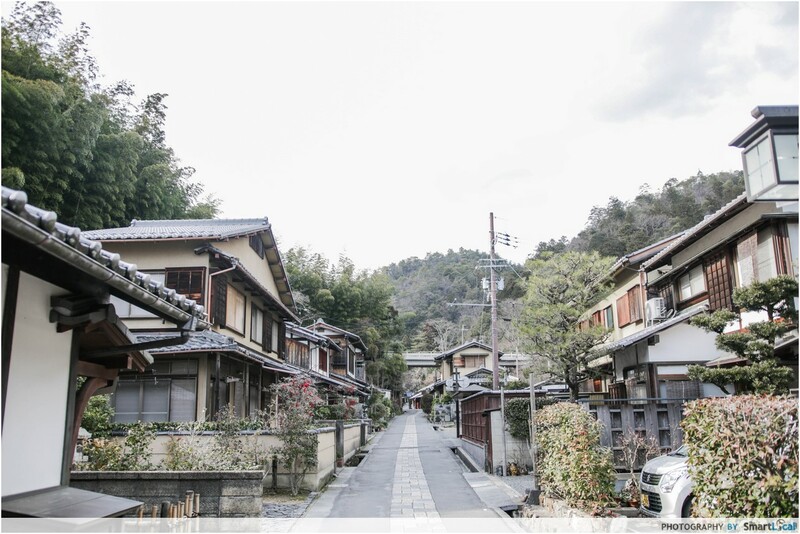 But when you get past that stage, you’ll start to see why so many locals make it a point to visit the onsen as often as they can. *Tip* Go into the hottest pool at the front first, so other pools seem like a breeze. Apart from the usual tubs and big pools, my favourite has got to be the ‘horizontal waterfall’ feature where warm spring water brushes against your back. It’s like a nice warm massage as you lay on your back. Though the pricing on the websites state otherwise, I only paid ¥1300 (SGD16) for late night entry at around 10pm, without usage of the swimming pool slides. 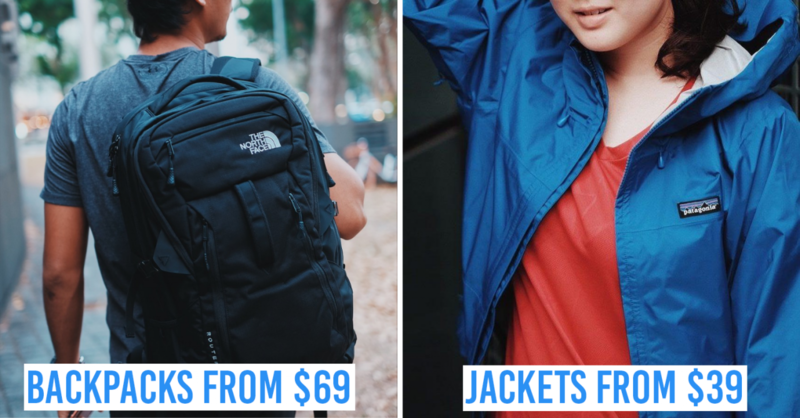 Find out more about their pricings here. 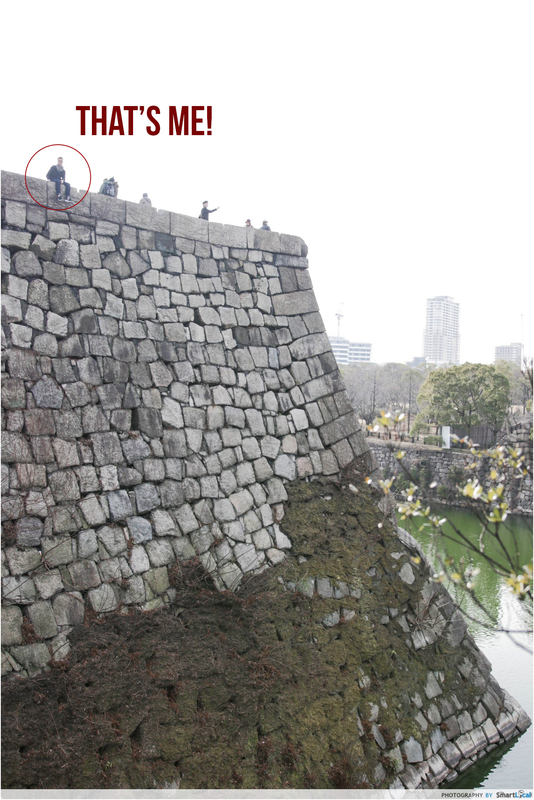 In the bustling Central Business District of Osaka lies this majestic landmark - the Osaka Castle. It stands as a scenic attraction today, but its existence is monumental as it represents the country’s resilience and strength. After facing destruction from troops and natural conditions from 1583 to 1991, the castle saw its most recent reconstruction in 1997 and has stood tall and proud ever since. Talk about a rough time, what an emotional rollercoaster ride. While the grandeur of the castle is quite a sight from afar, the interior has been repurposed as a museum for tourists to learn more about the castle’s history, as well as its residents during its heyday. And there’s more to look forward at the amazingly picturesque mid-summit resting spot. If you’re not afraid of heights, this is where you can get the #IGlife photo of all time, making your walk from the train station totally worth it. Not forgetting, you also get to don Samurai outfits and take a picture for free! My childhood dreams came alive when I received directions to the Pokemon Center. 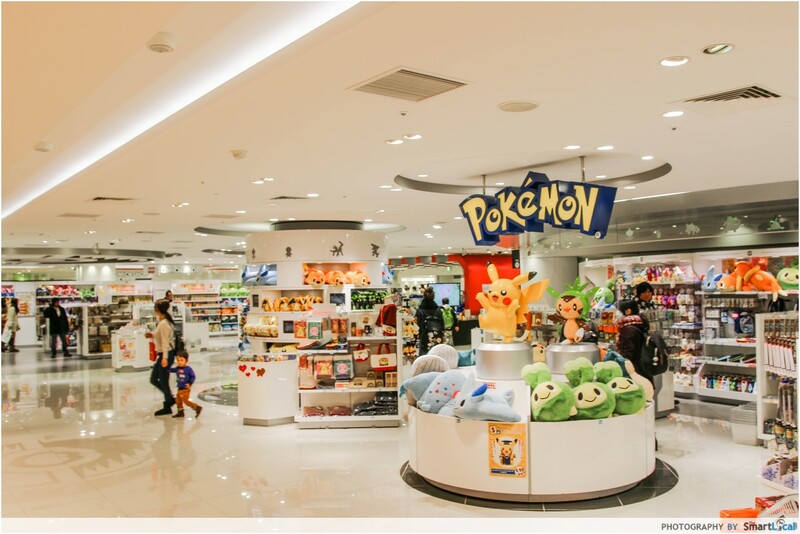 The top storey of the Daimaru Umeda department store is fairytale land for all you Pokemon trainers. 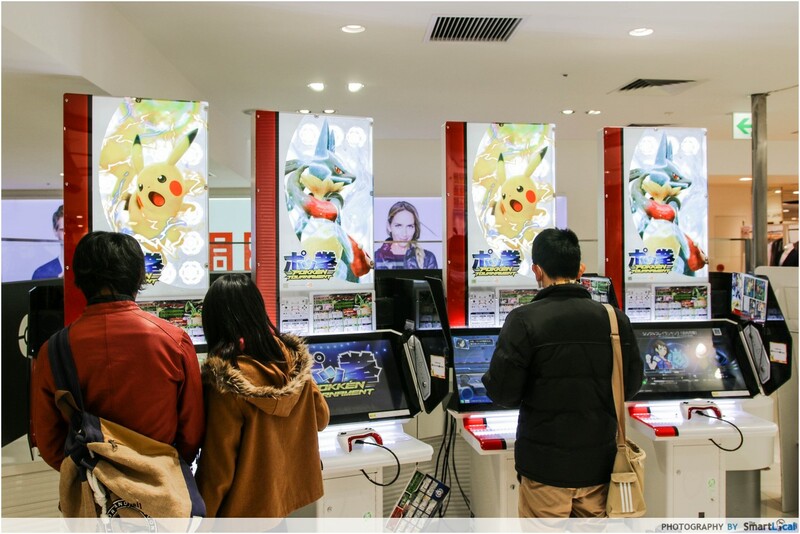 Although you won’t be finding real Pokemons or Nurse Joy behind the counter, this place is filled with Pokemon Merchandise and arcade games such as Pokemon Tekken. If you are there during the early days of the month, you can try looking for the limited monthly Pikachu editions, but they go out blazing fast so you are going to need some luck here. Be sure to pay the temples and shrines a visit before heading to the Pokemon centre. Dotonbori, the neighbourhood where we stayed, is Osaka’s food haven. 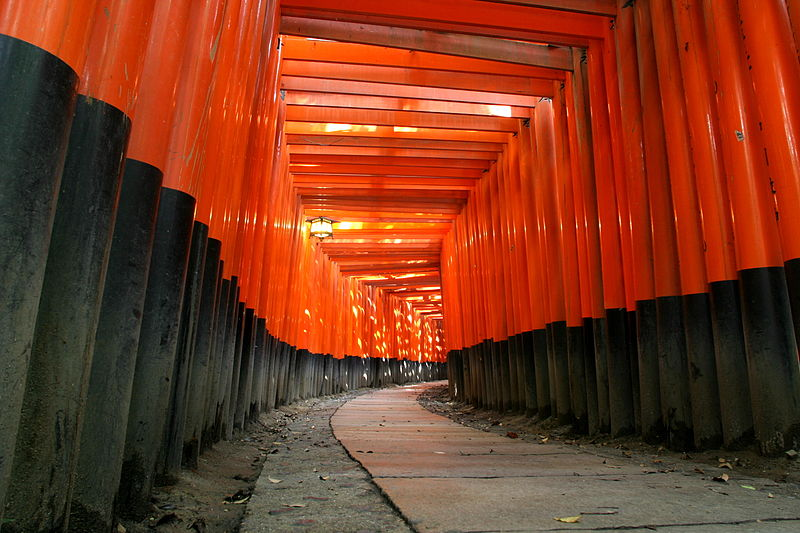 Its central location means you'll be able to visit the other nearby prefectures like Kyoto and Nara in under an hour. 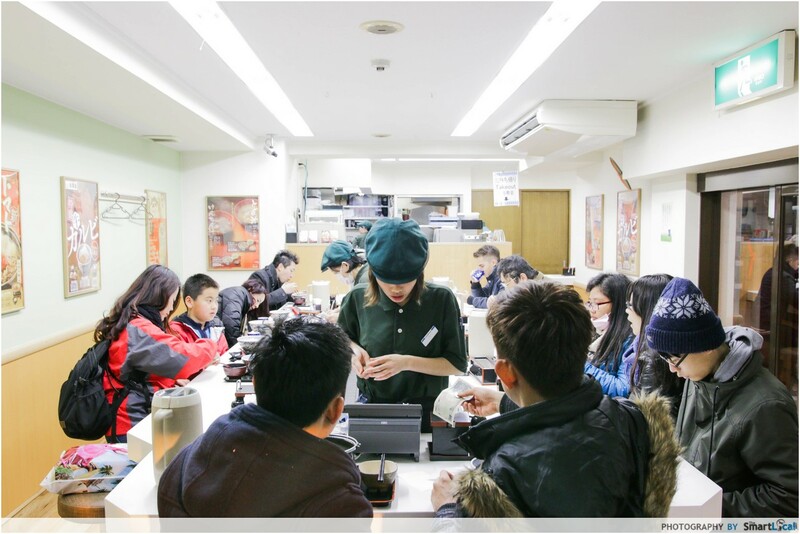 Osaka is home to 212 Michelin starred restaurants and Dontoburi is the epicentre of that. The countless food places that stay open till late at night with people lining up for them are proof that crazy queues exist in Japan too. 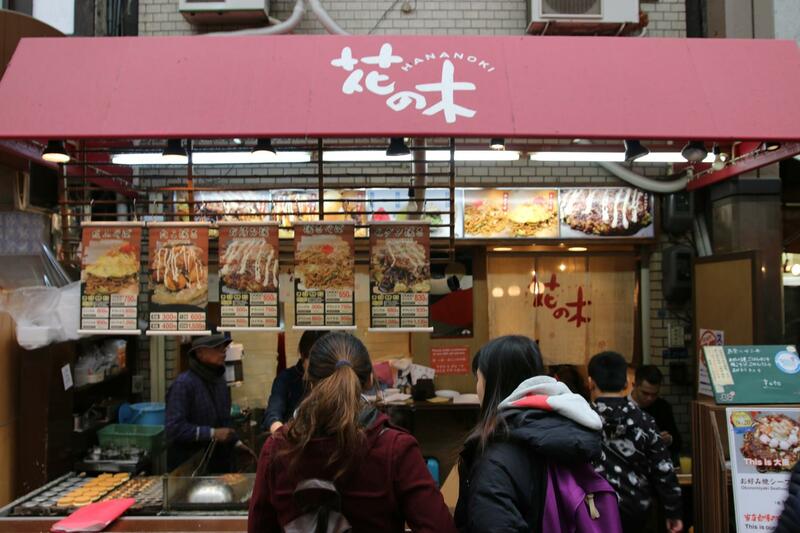 Be it takoyaki, okonomiyaki or yakitori, ‘yaki’ shops are littered across Dotonbori and one easy way to choose is to follow the Singaporean’s way of judgement - spotting the longest queue. 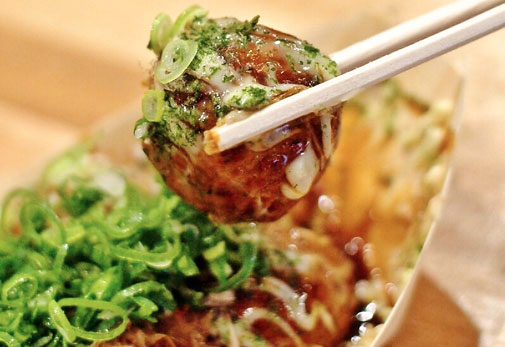 A definite must-try is the Acchichi Takoyaki. While there are pretty decent ones on our very own sunny shores, nothing can compare to savouring it during winter in the land where it all began. The key draw of this dish was the fact that the dough of their takoyaki wasn't chewy and melts in your mouth pleasantly. That, complemented by a perfect sweet-sour balance of the teriyaki-brown-sauce, makes for a orgasmic mouthful. Think of Kuromon Market as Osaka's Tsukiji Market equivalent. Known to locals as the Osaka Gastronome, the market is a sight to behold and an attraction in itself for all who enter. 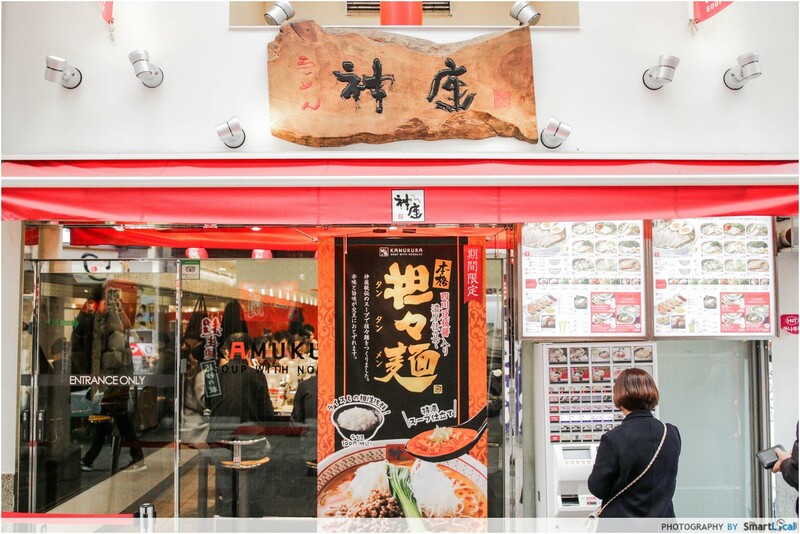 The indoor food street sports a colossal selection of some of the freshest cuts of seafood in Osaka from crowd favs like Salmon Belly and Tuna to more exotic options like Geoduck and Pufferfish. 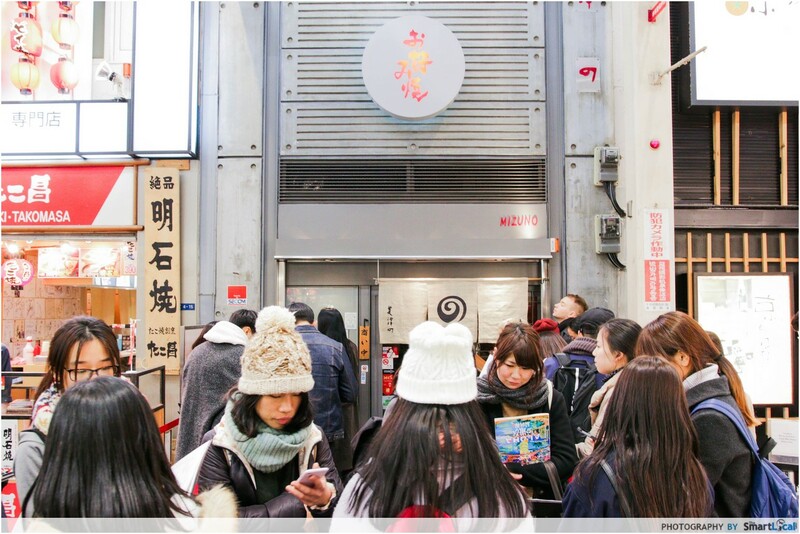 If you're looking for a little camaraderie on your trip but want to stay far away from the bustle of a big tour, then Magical Trip's Kuromon Market walking food tour might pique your interest. 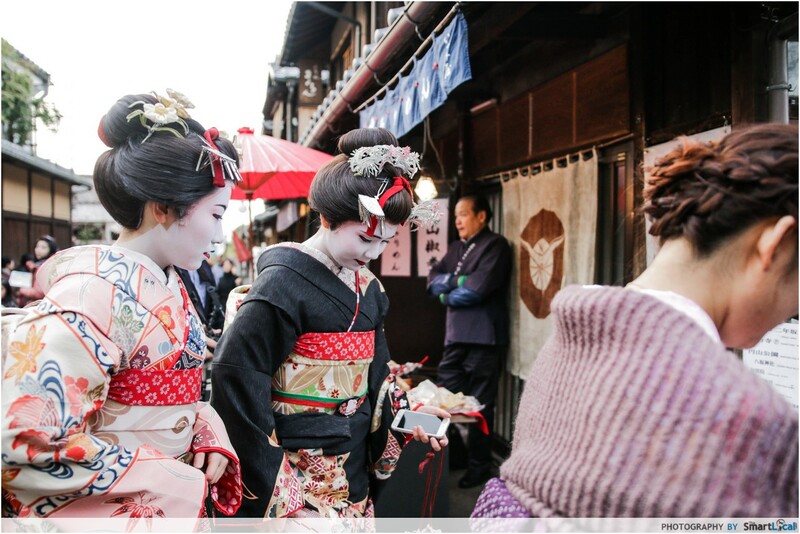 This small, guided walking tour will pair you with a local guide who'll let you in on the history the market and Osaka with pit-stops for you to sample the delicacies and order up a serve of grilled scallops and wagyu beef. The market is run by locals who don't really speak English, but your guide will be there to do all the translating and ordering for you. 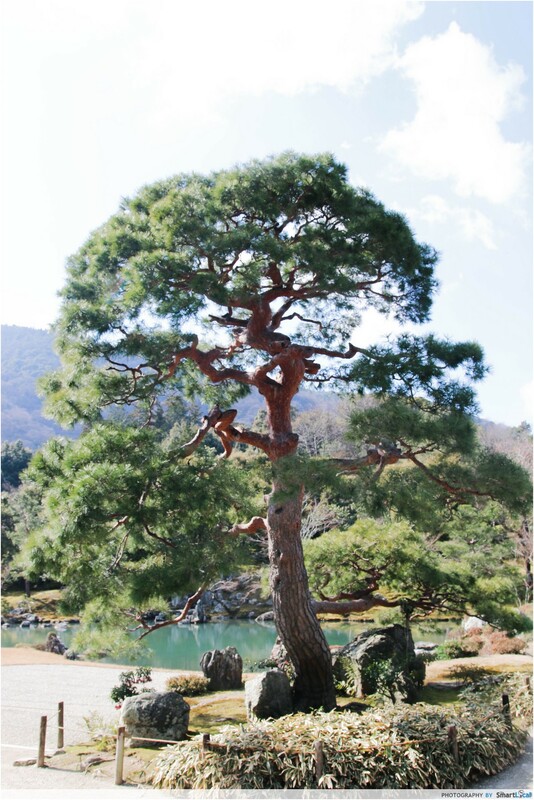 Be on the lookout for Japan's famed pineberries and locally roasted coffee. Scattered amongst fresh seafood and continuous strings of street food shops all around, I found myself at a humble establishment known as Hananoki. 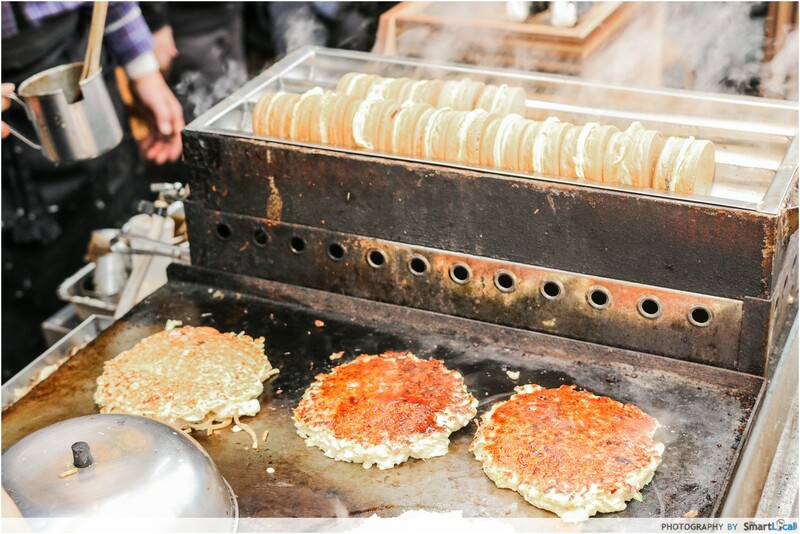 They serve up some of the illest local delicacies, including custard pancakes like the sort you’d find at Mr Bean. 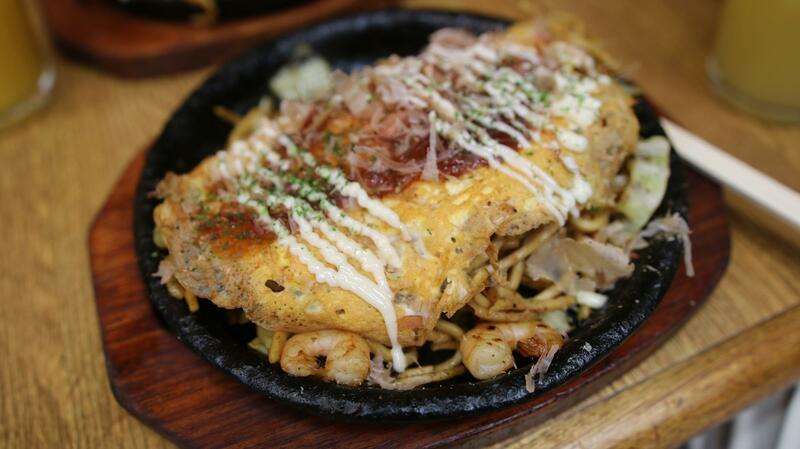 In addition to that, I also tried their Omusoba - Yakisoba topped with an omelette. A sinful symphony of cheese, teriyaki, and your choice of meat. Epic street food is what I live for! I chose the glutton life, and I ain’t turning back. 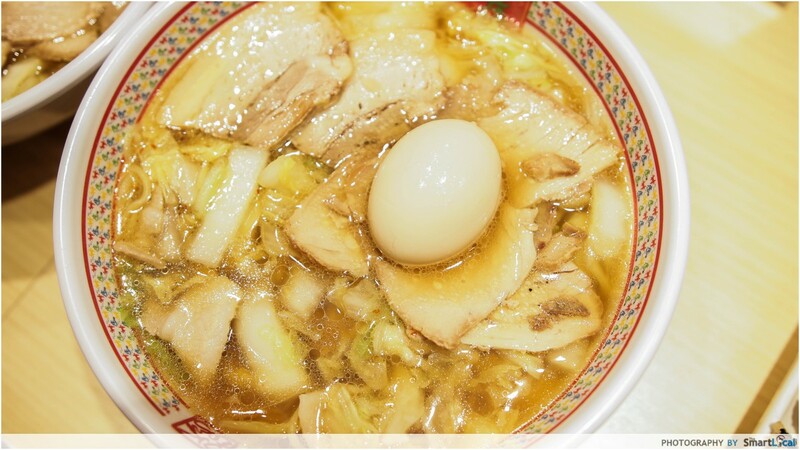 With a loudspeaker outside the shop declaring it as Japan’s most popular ramen joint, it’s hard to miss Kamukura Ramen. Though there was no telling if it was an "ownself say ownself" situation, I went with my growling tummy and ate it anyway. Regrets I have none. The broth treads on salty, but just milliseconds later, the full ensemble of flavours kick in to remind you of what the loudspeaker was preaching. Don’t get me started on the super springy noodles accompanied by a glistening piece of cha shu. Opening Hours: Daily. 11pm-10am; Saturday and Sunday 11pm-12am. 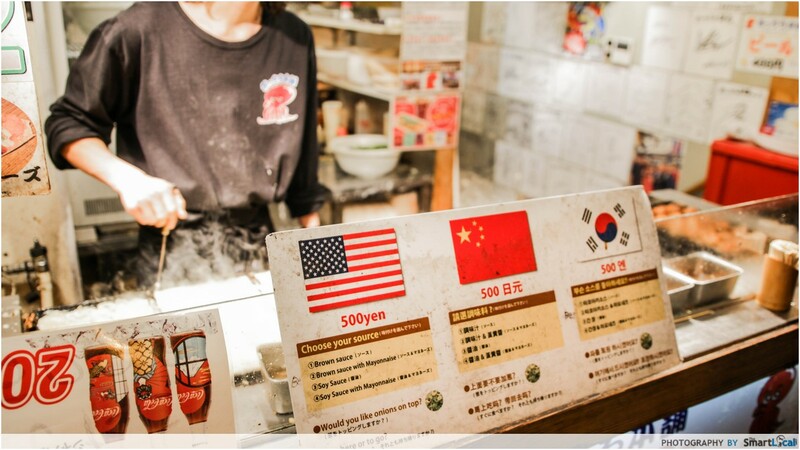 It’s not surprising for one to search for authentic Japanese cuisine such as sushi, takoyaki balls and ramen when visiting the Land of the Rising Sun. But this place, was a serendipitous delight like no other. During our hunt for food one night, we came across this 24-hour eatery which serves up local dishes out of the ordinary. For starters, there wasn’t a crazy queue like the other places we saw. 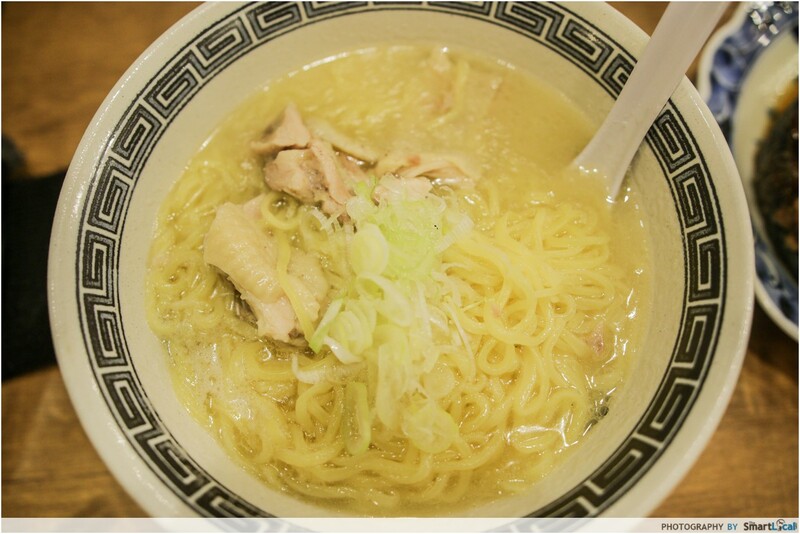 Don’t be fooled by their unassuming storefront, take their basic Chicken Soup Ramen for instance. With a perfectly seasoned soup base and a healthy serving of shredded chicken, the noodles were cooked al dente and served to us piping hot. The broth was slightly thicker than usual, which interestingly forms a sort of gravy for the noodles. If a Michelin star chef cooked your maggi mee, this is probably what you would get. It was the perfect comfort food to feed the growling tummy and warm the soul. 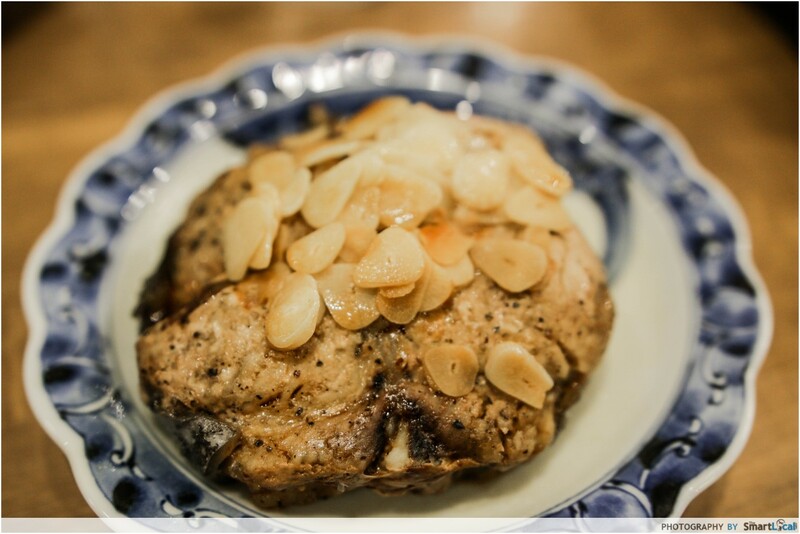 Here, you can also order whole Tuna tail garlic steak for just ¥600 (~SGD7.38). 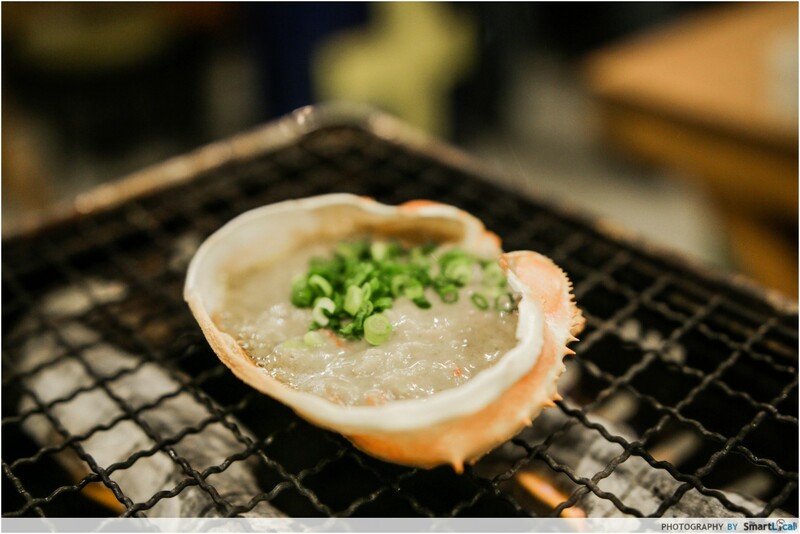 One of the quintessential dish to savour while at this restaurant is undoubtedly the kani (miso) crab (¥500/SGD6.13). It didn’t look appetizing initially, but curiosity got me to order it nonetheless. Thank goodness I did because this became one of the defining dishes of my entire trip. Imagine a stew-like dish seasoned to perfection, with everything you love about crab contained in every spatula. 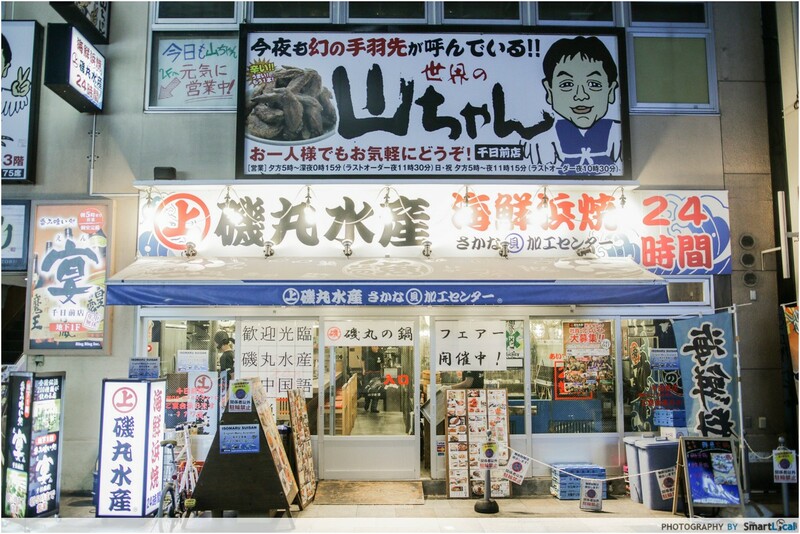 Directions: Lookout for the blue billboard from the picture when you enter the Dotonbori food street. It is within the first 3 shops you see. 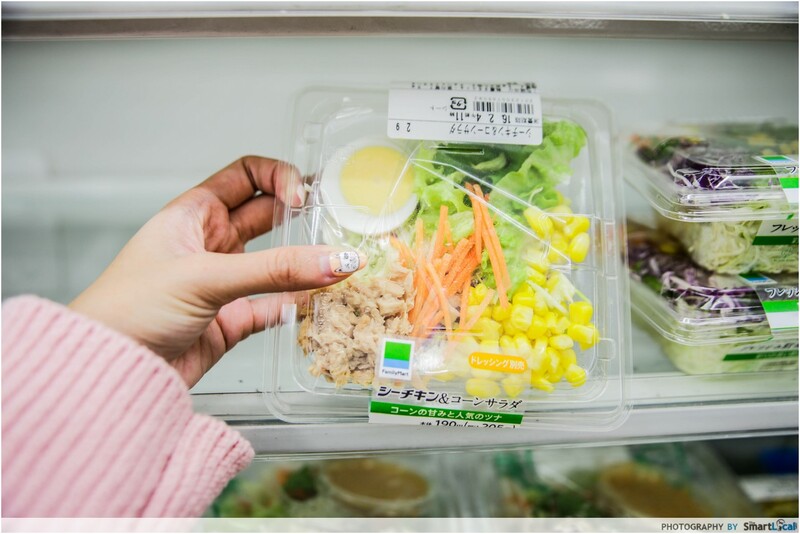 From legit mouthwatering food indistinguishable from freshly cooked meals to winter accessories for those who need an extra layer of warmth, the convenience stores in Osaka - or Japan as a whole - give the word ‘convenience’ a whole new meaning. 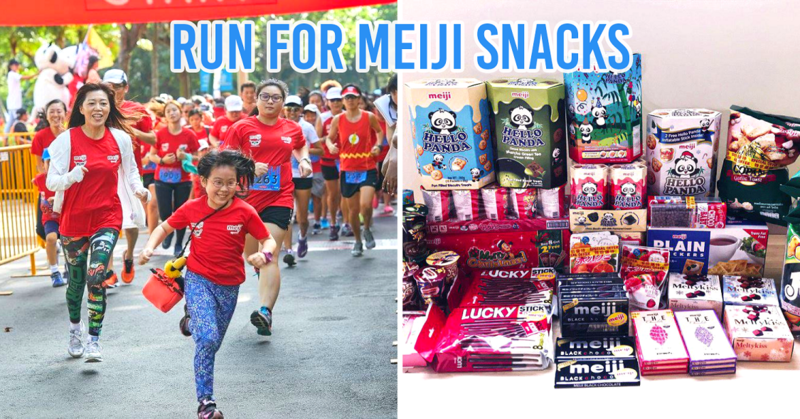 From the familiar 7-Eleven signboards to the more obscure Family Marts, you are more likely to win 4D than find yourself in a street with no convenience store in a 200-metre radius. All we can say is, well done Japan. 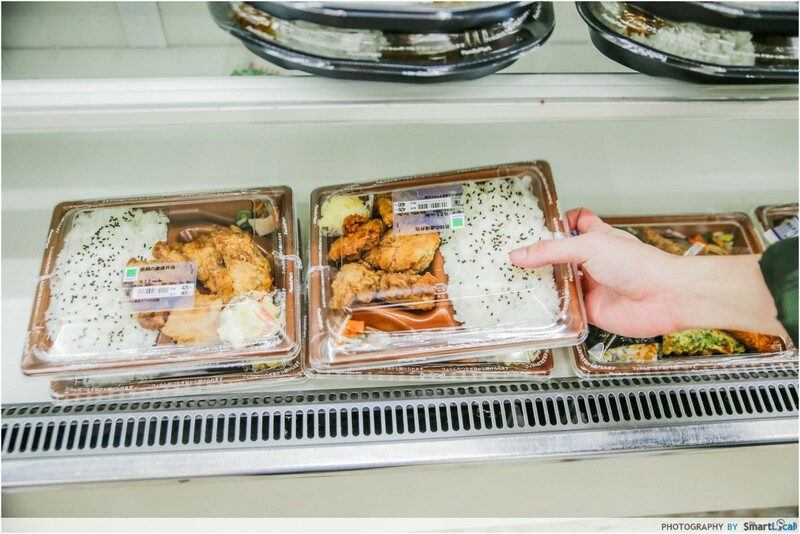 Your convenience store game is indeed very strong. 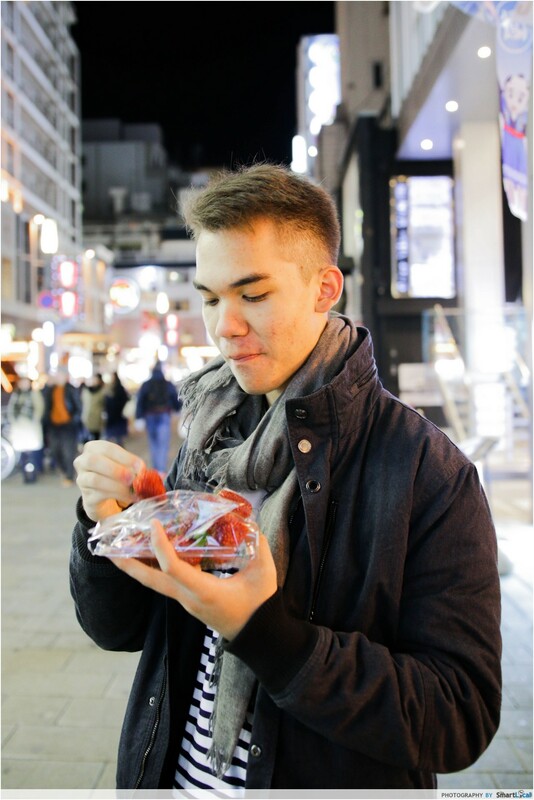 Japan’s famed strawberries are legendary, even before stepping foot in the country. I first heard of these miracle berries years ago and have been dying to get up close and personal with them when visiting the country. As you can imagine, I wasted no time snagging some for myself even though a box costs upwards of SGD10. My verdict - these strawberries tasted heavenly and were plumper, juicier and sweeter than any of those I’ve sampled back home. For once, dipping them into chocolate seemed like a hassle. Osaka’s proximity to 3 other prefectures: Kobe, Nara and Kyoto (all within an hour’s journey away) makes it an ideal transit state, or what I’d like to call ValueTown. 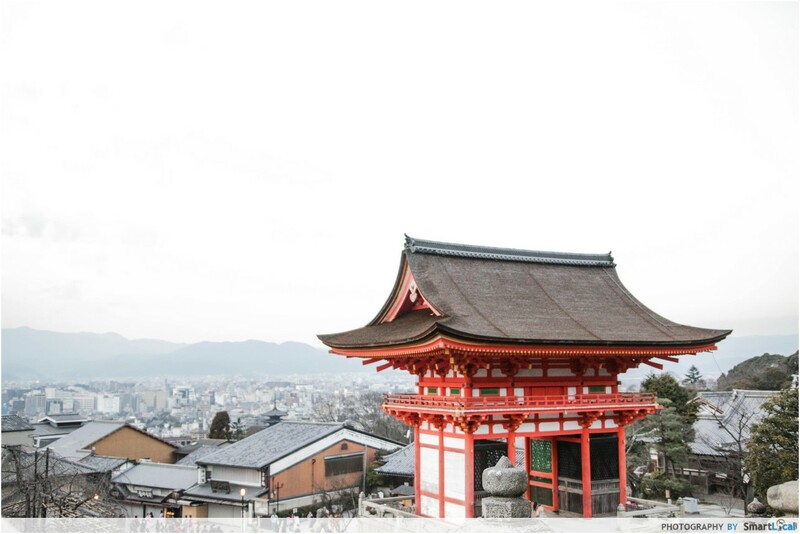 As we only had 72 hours in Osaka, we chose to uncover Kyoto and Nara for their scenic and cultural aspects, unfortunately leaving Kobe out this time. There are many ways to get to Kyoto by train, depending on how much you want to spend and how time-starved you are. We took the JR special rapid train, which takes you from Osaka to Kyoto station for Y560 (SGD7). But if you’re really kiasu and want to experience the most out of Japan, cut that travel time by riding the JR Tokaido Shinkansen which takes only 15 minutes, but that would cost you Y1420 (SGD17.50). I found this to be one of the spectacles of nature in Kyoto. 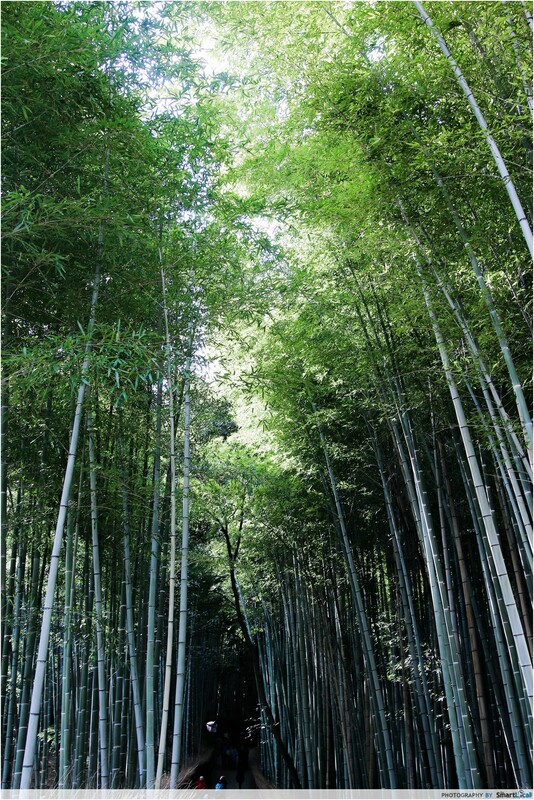 It might be a simple and short walk down a lane surrounded by Bamboo trees, but it makes for a therapeutic trail. Without distractions from urban structures or pop-up carts, this is where you will truly feel at one with nature. 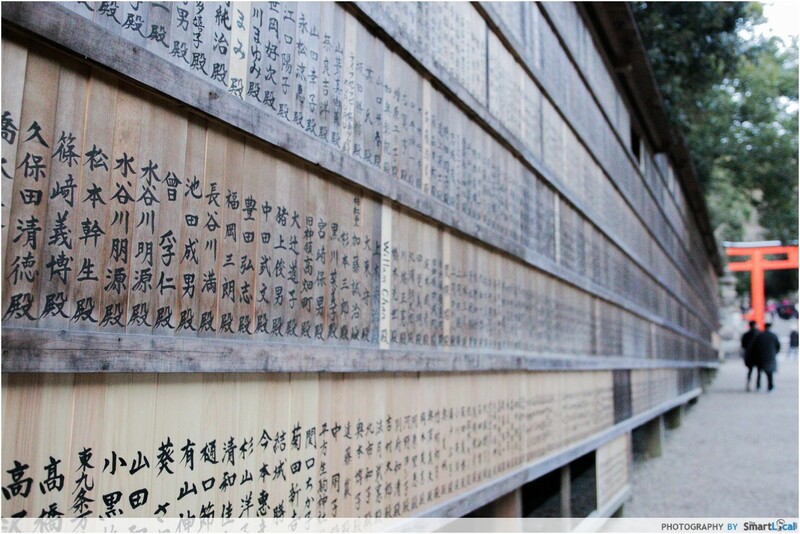 This place is one of the few head temples of Zen Buddhism, and you can easily tell why. 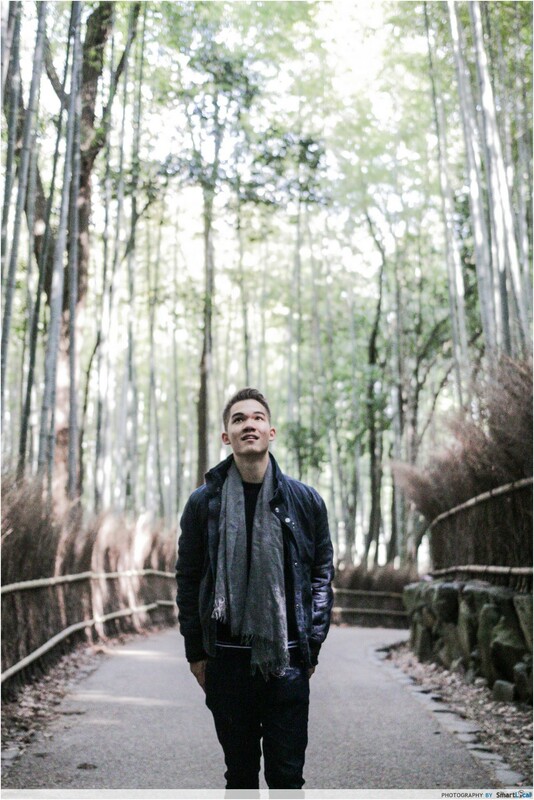 The ambience of the place permeates tranquility, a setting of pure scenic beauty and serenity. You can easily spend a good half hour just sitting there emptying your mind and enjoying the sight before you. 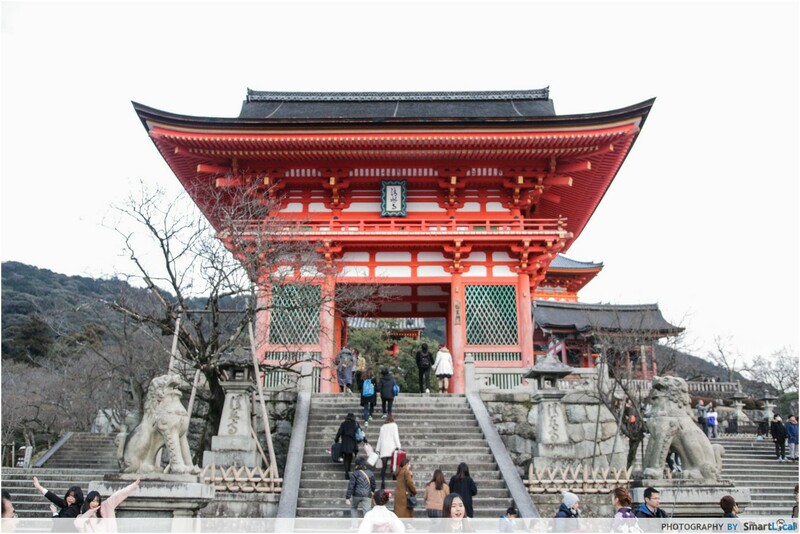 It was a really long walk to get up there, but for one of the iconic temples in Kyoto, you might want to strain your legs a little. 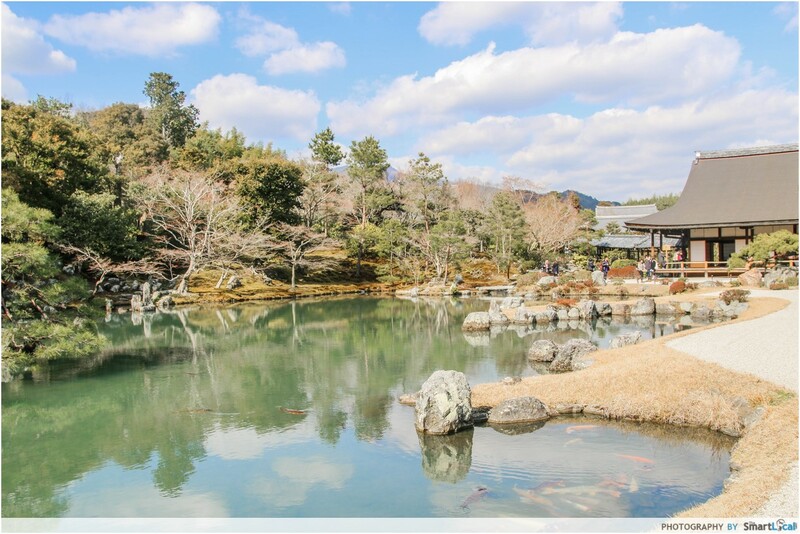 The view at the summit was a prime incentive to make the climb - a panoramic view of kyoto’s contrasting landscape between the traditional and the modern. There are also Kimono rental places around, so it is very likely you will get to spot a few super-tourists going full-geisha. Price: Entrance fee to the temple is ¥400 (SGD 4.9). While most tourists would come here to hike the mountain trails, basic me came here to capture an Insta-worthy photograph. The iconic black and orange pillars are donated by rich businessmen or companies, and each donor is credited on the pillar they helped build up. Each pillarcosts a minimum of ¥400000 (SGD4904) and can go up to ¥1million (SGD12259) for the bigger ones. Beyond this gateway is where the God of Rice and fortune lies, explaining why all these donations were made here. Since I do not have the budget to donate a gate, I’m hoping an upload on social media would enable some of the luck to rub off me. 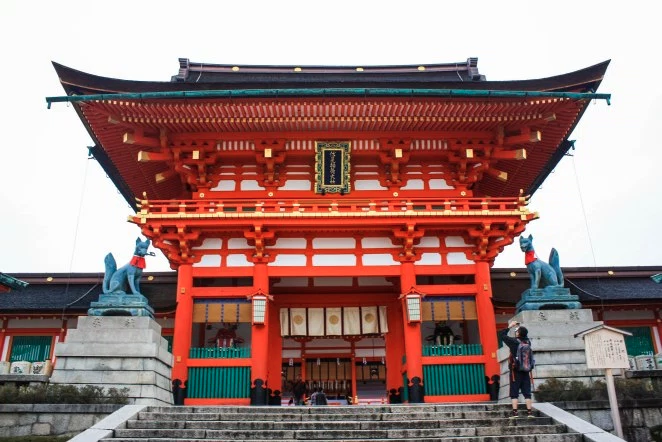 Although many would see Kyoto as a hotspot for culture, truth is older architecture often have to make way for giant superstructures in the name of technology and modernisation. Untouched since 1868, Saga Toriimoto has been preserved in its full vintage form and beauty. It’s a good place to have a quick look around, explore the area on your bicycles and snap a few shots if you have got that extra bit of time. The fastest way of getting to Nara from Osaka is via the Kintetsu line Rapid Express Train, which only takes 45 minutes. That’s basically a trip from Orchard to Pasir Ris. If you are unsure of which train to take, simply ask the station masters at every stop. Who knows, their local knowledge might just help you get a good 20 minutes off your original route. 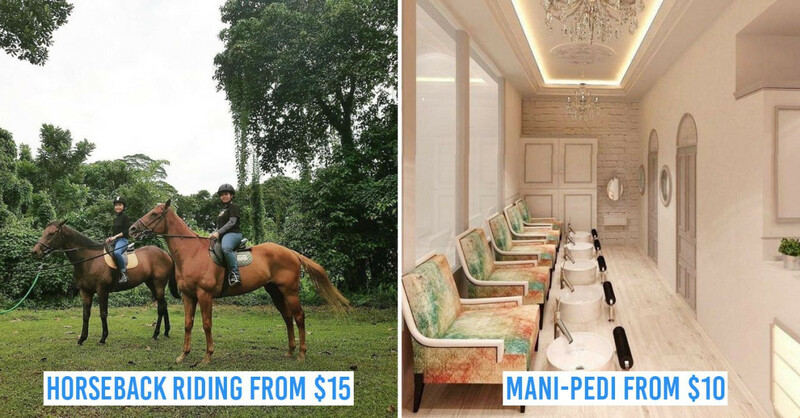 It is imperative that you rent one of these. 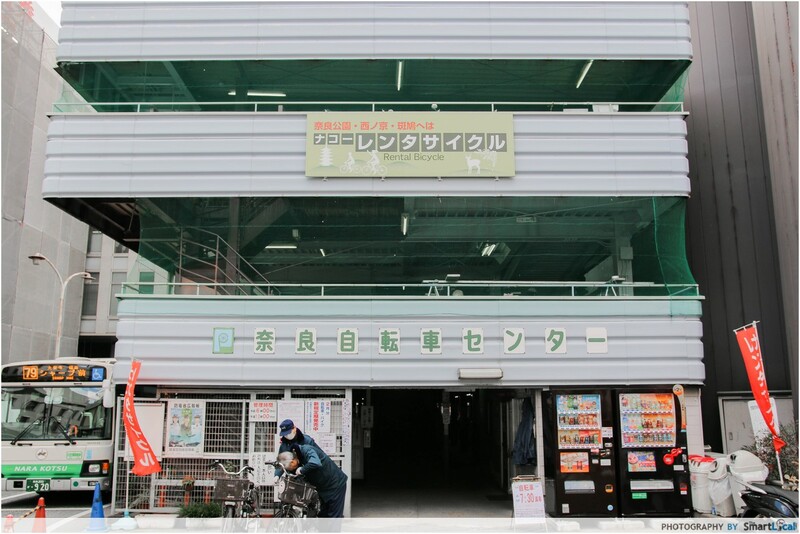 Right as you exit the train station, you will find a bicycle-carpark which serves as the storage for bike rentals. They provide “Electric Bikes” as the stallman named it. I thought it would be similar to a scooter of sorts, but it turns out it was actually a legit accelerator assisted Bicycle. Much like picking up a powerup in mario kart, a gentle step on the pedal gives you a crazy speed boost. It also makes riding upslope no different from riding on plane ground. It takes some getting used at first due to the sudden accelerations, but once you get a hang of it, you’ll never want to ride anything else again. Trust me, this is a whole experience by itself! With our super bikes, we swiftly weaved past the initial crowds. 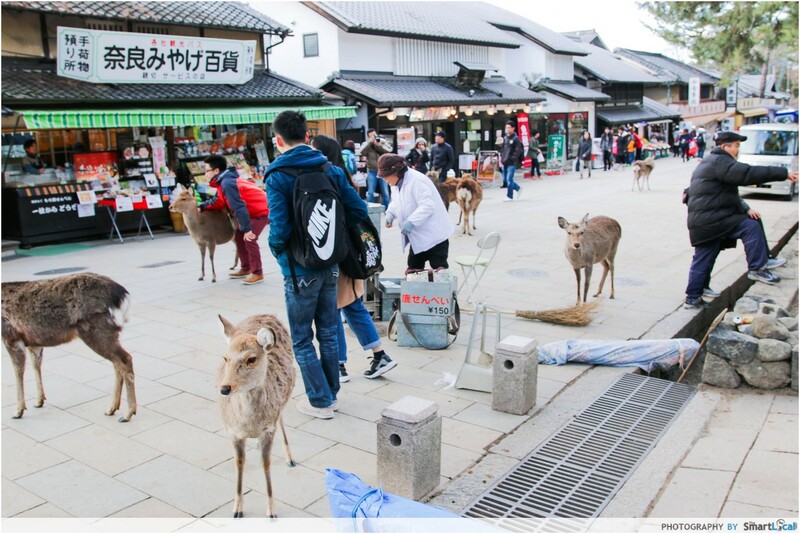 Before we even reached the heart of Nara Deer Park, we were already greeted by these friendly creatures roaming the pavements. 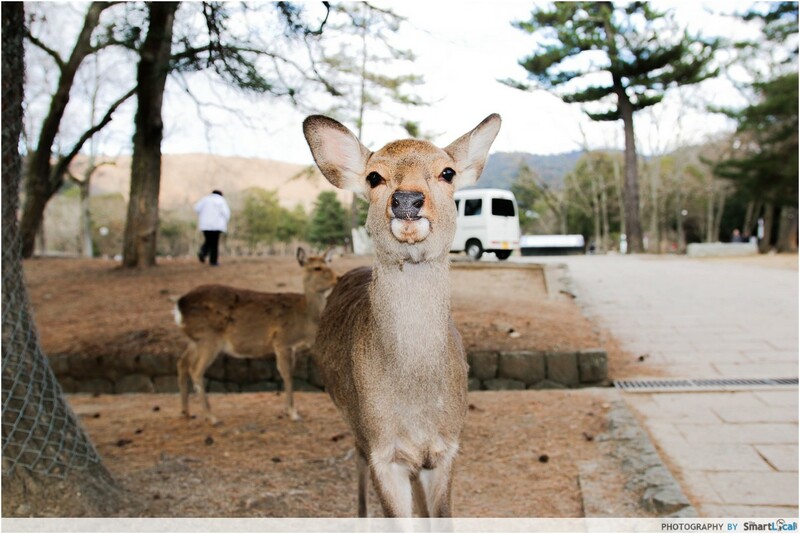 A little further in is where the main bevy of deer await you with sparkling eyes coyly baiting you to buy them treats. You can get these treats from several carts manned by grannies who sell deer cookies at Y150= SGD1.84 per bundle. I’m not sure what ingredients are in these cookies (even though I actually tasted one) but the deers are beyond addicted to these magical treats. Don’t be fooled by their demure and lazy front, they’ll start nudging and following you wherever you go after a round of treats. I tell myself it’s because they like me and not the treats. To calm down from the high of playing with nature’s very own, what better way to regain a sense of zen other than coming into close contact with a giant Buddha statue? 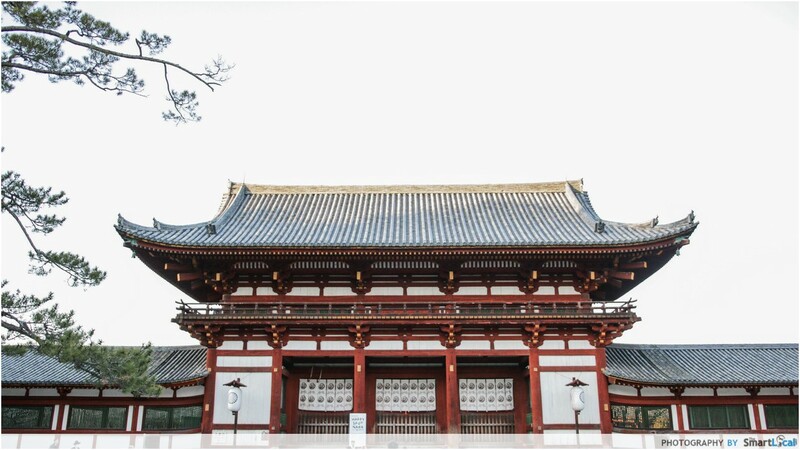 Located in the heart of the Todai-ji Temple, a grand pinnacle of heritage and culture, is this iconic deity gargantuan, whose hand alone is as tall as a human being. 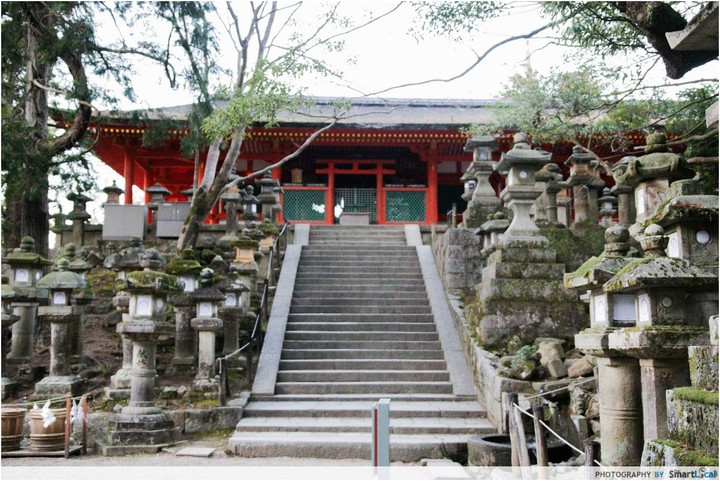 This is one of the most prestigious temples of the land, which served as the head temple of all provincial Buddhist temples of Japan back in 752CE. 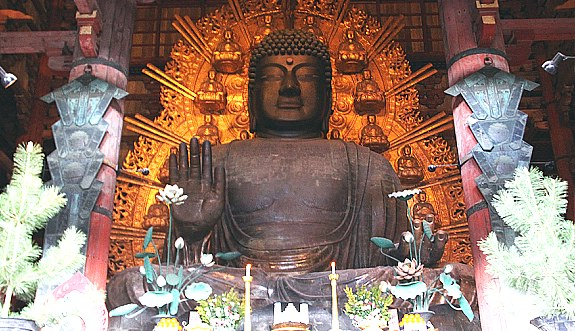 Now, the Todaiji’s main hall is also the world’s largest wooden building; a whole structure built solely out of wood. No nails, no glue, nothing else holding it together. Do note that the shrine closes quite early at 5:30pm so start your day early if you don’t want to miss this! 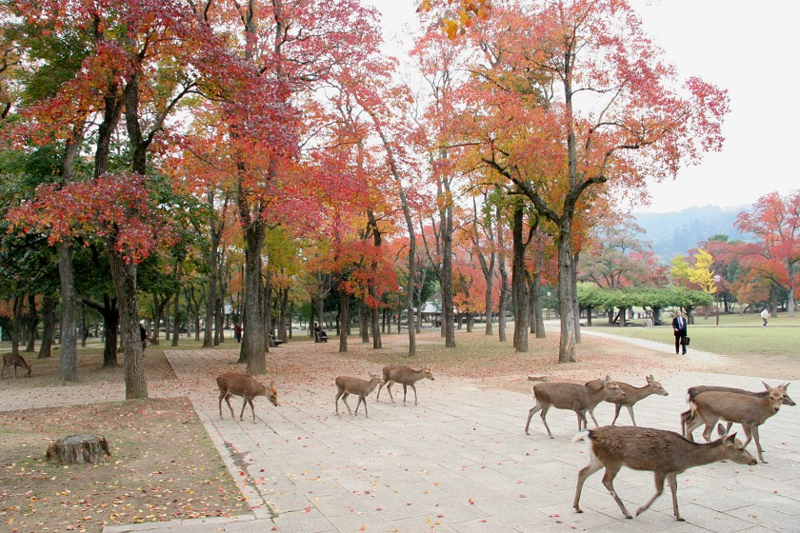 On the other side of Nara Park lies one of the most celebrated shrines of the region. With your electric super bikes, scaling across the park would be a piece of cake. 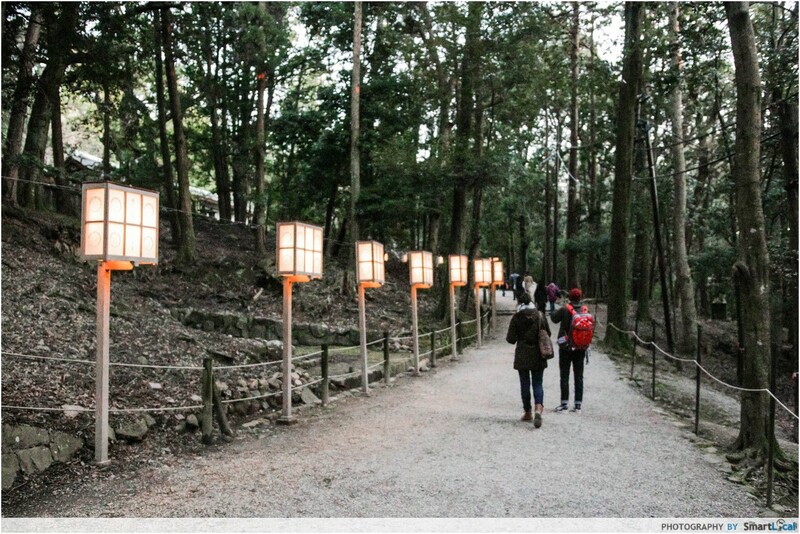 I felt like I was transported to a scene from spirited away by spooky lanterns guiding my path to the shrine. 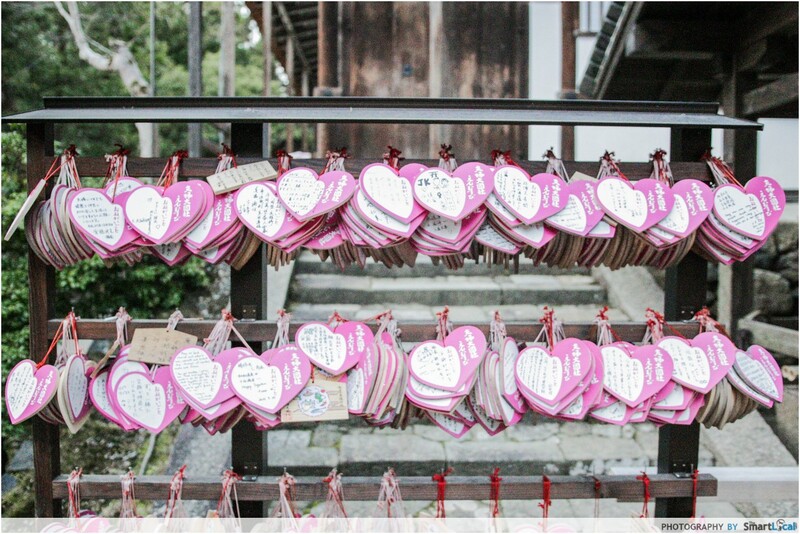 Witness priests giving talks or write love letters and hang it on the Japanese version of ‘love-lock bridge’. If you happen to be single while passing through this bridge, take this time to have your fortune told by buying a fortune note. There’s some trick to unveiling the oracle - you have to dunk the note into a tiny pool of water, after which japanese characters would slowly appear. Unfortunately your fortune in japan does not come with English translations so make sure you’ve got an interpreter with you. The note might just hold the secret to where love blossoms. 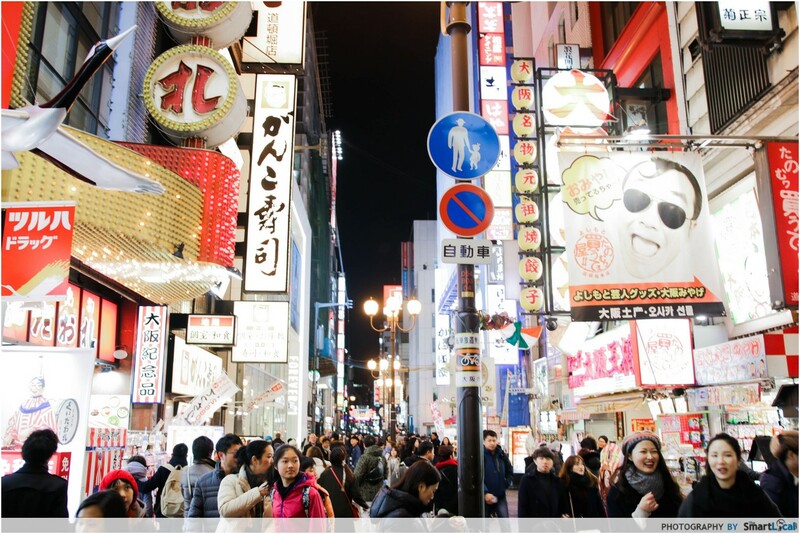 If you do plan on visiting Osaka, finding accommodation around the Dotonbori area is your best bet at experiencing most of this city with limited time. With mouth-watering food at every turn and recreational activities that entertain you at 120%, this is undoubtedly a dream city destination. 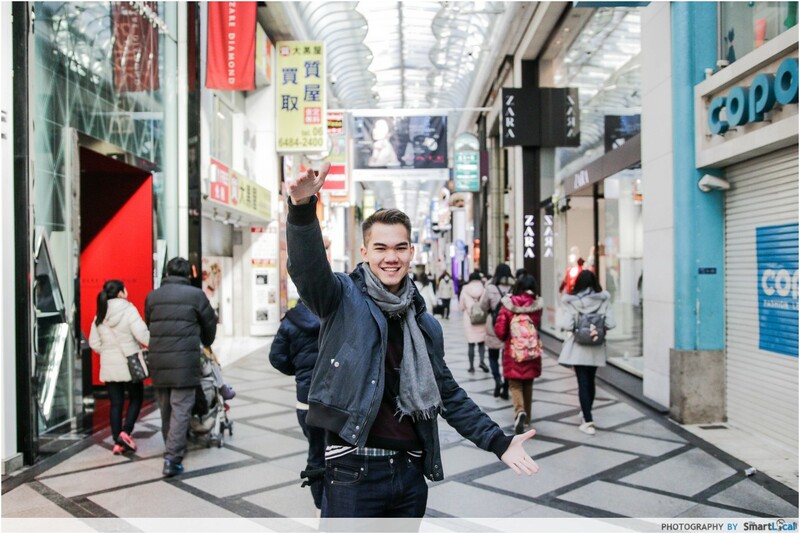 You can easily get to the city central station (Osaka Station) and travel to rustic cities nearby within an hour’s time, and with that you have truly got the best of both worlds. I was never one for low cost carriers until this trip. Scoot is the only airline in the world that flies an all-Boeing 787 Dreamliner fleet which is big and spacious, unlike the usual cramped single-aisle planes you might expect from low cost carriers. In addition to space, what I really liked about Scoot is the option to customize my seats. You could book an upgraded Super-seat (30% more legroom) or Stretch-seat (50% more legroom). As someone who towers above most people, having that extra bit of leg space is the key to nirvana at 40,000 ft in the air! Transit times were perfect. I only waited an hour in between, giving me enough time to stretch my legs, diva-stroll my way to the next gate and still take 20 minutes to do some light shopping. I did not have to change my seat either, making it very convenient to board each time. 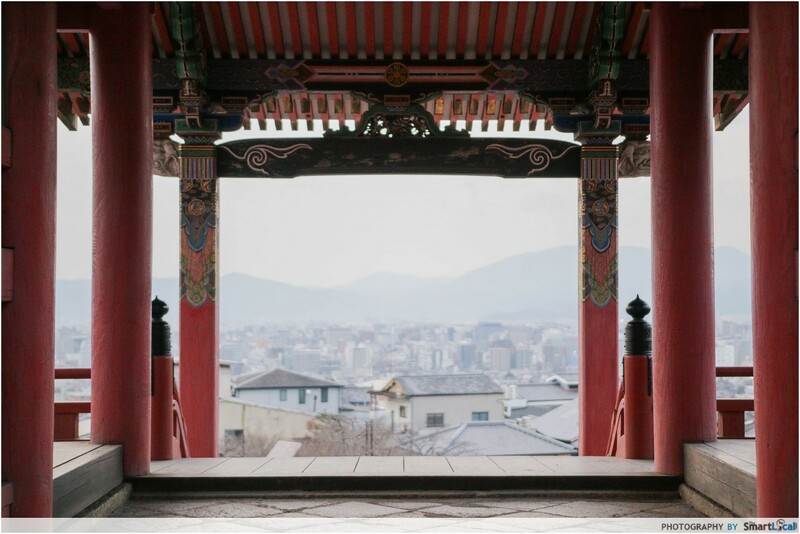 If you’re looking for a new weekend adventure in Japan, Osaka might be your best bet. Consider this list your best guide to 72 hours in Osaka, but there’s so much more waiting to be discovered. Start rallying your friends or even better, take a spontaneous trip by yourself and Get Outta Here! 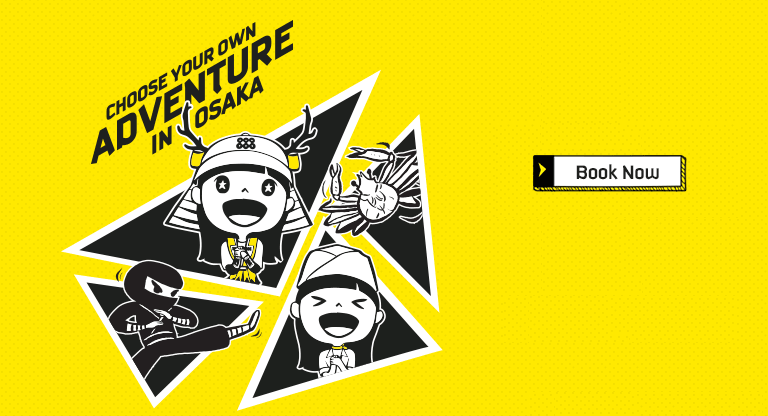 Scoot flights to Osaka start from *$168. 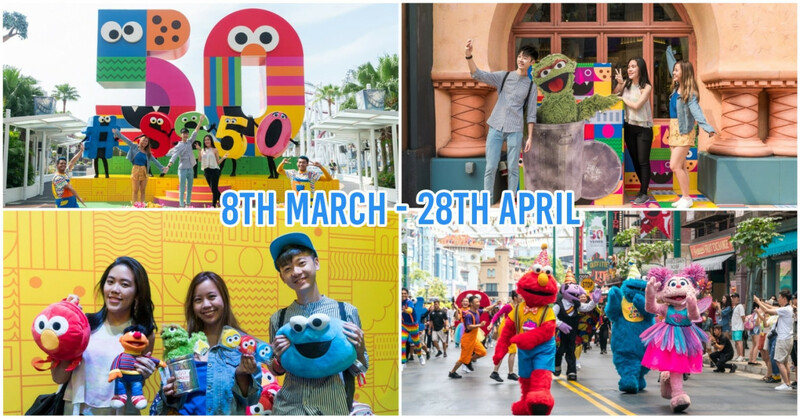 Book your tickets to Osaka now! This post was brought to you by Scoot and updated in collaboration with Magical Trip.